Voice, one the most wonderful gift by God to all human beings, which we use to express our feelings, emotions, knowledge, need and wants. However, sometimes it becomes bit difficult for an individual to express & convey the appropriate message which he or she wanted to share. this could be due to any of these problems like stage fear, low confidence, monotonous voice modulation, low pitch voice, very rude voice, and etc... this might effect your relationships, job and may be your social life. It is very essential to understand the situation & person where in we are going to address or communicate, it could be presentations, speeches, telephonic conversations or one to one talk. 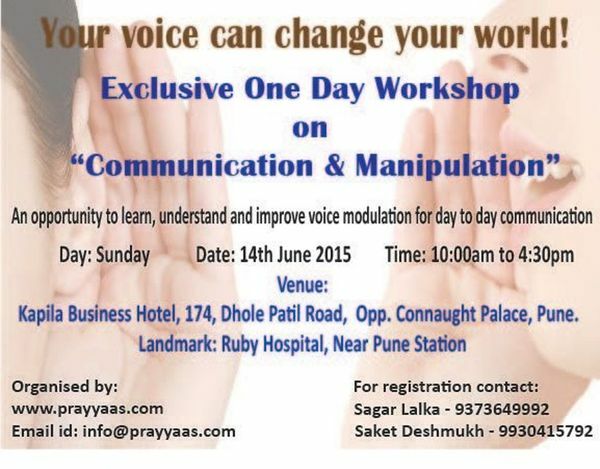 Considering this, www.prayyaas.com is organizing a exclusive one day workshop on Communication & Manipulation for all those who wish to understand their voice, improve their presentation & conversation skills, over coming the fear of not socializing (Manipulation) and beyond that someone who really want to have effective communication(enhancing Voice Modulation) and use it in your day to day life. The workshop will be conducted by Mr.Shashank Joshi who is an experienced & professional voice over artist, an actor and a certified trainer too. The Registration fee for the workshop is Rs.900 per person which includes Breakfast, Lunch,High tea, participation certificate & beautiful seating arrangement. Last date to reserve your seat is 11th June 2015, Thursday.